Studying in North Macedonia can be a unique way to discover more about our country and experience it in the right way. This website will provide you the necessary information to study at the International Slavic University “G. R. Derzhavin”. We are an official Russian partner University that offers a variety of courses. 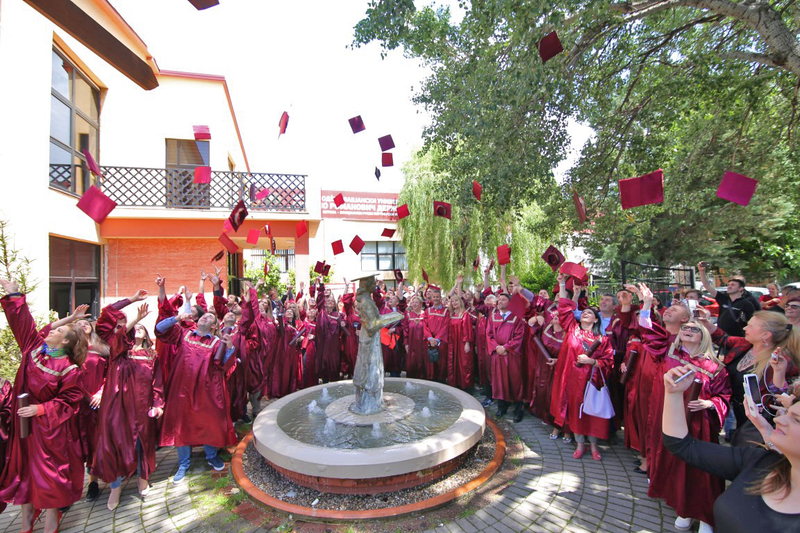 The International Slavic University “Gavrilo Romanovich Derzhavin” was founded in 2004 as one of the first private universities in North Macedonia. We have two campuses in Sveti Nikole and Bitola, where more than 2000 students are currently enrolled. Sveti Nikole is an hour away from the capital (by car), and is a good choice for those who prefer a quiet student life, while Bitola is for the ones who prefer a busier lifestyle. The International Slavic University “Gavrilo Romanovich Derzhavin” is a home to over 2000 students in two cities – Sveti Nikole and Bitola, where both of our campuses are stationed. Our University was one of the first private Universities ever established in North Macedonia. Throughout the years the University has developed strong connections with many Universities, organizations and companies. One of our key partners is the Tambov State University “G. R. Derzhavin” from the city of Tambov, Russia. We’ve been partners for ten years, and throughout those years we’ve collaborated on many projects, conferences, summer schools and we’ve done many student exchanges both in Russia and North Macedonia. Since the founding of the University, we are here for our students at all times. We help them discover their interests, develop their own talents, and master new professional skills. We help them live their vision. Our Career Center will help you focus on your future career and master the needed skills for the profession you are pursuing. Your Career Center mentor will be your guide throughout the year, who will help you gather information and explore in order for you to meet your goals. The students spend a significant time at the university and during that time we become their home. And home wouldn’t be home without support, understanding, time for relaxation and friendship. We want to make studying as pleasant as possible for our students! Everyone is welcome here! You can visit us anytime you want, stroll through our campuses, meet our staff, talk about your future. In every step of the way you will see activities you could take part in. We have enough room for studying, making friends, coffee chat… All of these places will be your second home during the studies. In Bitola and Sveti Nikole we have over 6500 m2 of conference halls, amphitheatres, classrooms, laboratories, workshop space, libraries, restaurants, student cafes, bookstores etc. Our campuses have conference halls, amphitheatres, classrooms, laboratories, a fully equipped library with reading room, restaurants, student buffet, bookstores, etc. During your studies, these places will be your second home. Our staff cares about you! That’s why our staff is always available in and out of class, and they will always be happy to help you. Since day one we give you access to their e-mail addresses and their phone numbers, so you can earn any information you need, anytime. They will be happy to assist you and give you all the information you need. Please click here to fill in the form. This is how we are going to contact you, so please make sure you write down the correct e-mail address! If you'd prefer to be contacted by phone, please enter your number. If not, leave empty. Please take into consideration that sometimes it might take up to 48 hours (or more) to respond.